The Digital Marketing Sales Representative will be responsible for consistently winning new business via inbound and outbound initiatives, proposing a wide range of digital marketing solutions (web design, SEO, PPC, social media, content) to small to medium-sized businesses across all industries in Canada, North America and internationally. Due to the enormous growth potential in our industry, BlueHat Marketing is expanding its sales team and seeking to hire only highly motivated, results-driven individuals. We are looking for an enterprising person to grow and advance with us—an energetic team player and headstrong Digital Marketing Sales Rep that can tackle the market and exceed goals of a diverse client base! 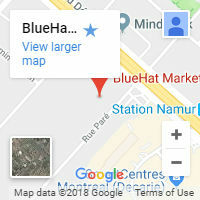 BlueHat Marketing is a leading Canadian digital marketing agency based in Montreal. 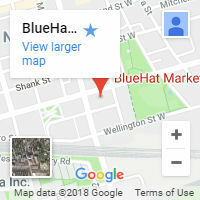 BlueHat Marketing provides B2B personalized results-oriented digital marketing services across Canada, North America and international markets. We help businesses improve revenues, profits and brand equity. Our team is made of highly qualified IT professionals, Web developers, programmers, digital marketing sales consultants, social media and business analysts, content writers, designers, E-commerce specialists, with decades of combined experience in search engine optimization (SEO) and Lead Generation. Sales Execution– Ability to communicate effectively on the phone; close contracts once all clients’ needs have been identified and addressed with BlueHat-proven solutions. Depending on the performance in this position, there may be different opportunities for growth within the company in the business development and sales functions. Casual, fun environment—wearing jeans is acceptable!